AmericanBridal.com is offering 15% off order of $100 or more this weekend. Use code cart15 at checkout. Hurry, this coupon expires Sunday, Feb 20th. Plus, starting Monday, shop gifts for your bridal party at up to 50% off! Deal of the week goes to this Heart Locket Bracelet, it is only $11.95 with free personalization. Bracelet features dainty faux pearls with a lovely heart locket, which can be engraved with the bridesmaid's single initial. Your girls can wear it on your wedding day and beyond. Coupon cart15 valid Friday, Feb 18th through Sunday, Feb 20th. Bridal party gifts sale starts Monday, Feb 21st and ends Thursday, Feb 24th. These iphone cases are compatible with Verizon & AT&T iPhones. For free shipping, just enter code: IPHONECASE4V at checkout. This is good till Feb 28th, 2011. To qualify for this free shipping offer, one or more Zazzle Cases must be purchased. Enter promo code IPHONECASE4V at checkout to receive the free shipping offer. This free shipping offer is for standard shipping to US addresses only. Shipping charges will apply to oversized orders and orders being shipped on an expedited basis or outside of the US. Offer is valid through February 28, 2011 at 11:59 pm PT. Your order must be placed during that time to qualify for this special offer. This promotional offer may not be combined with any other Zazzle promotional or discount offers. Offer valid on Zazzle.com only. Happy Valentine's day everyone! 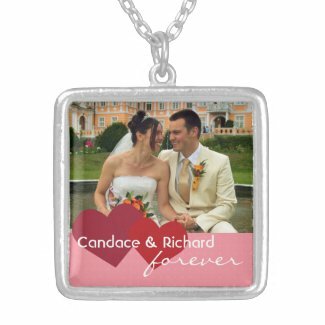 Zazzle is spreading some love by offering 14.02% all products. Just enter coupon code: IHEARTZAZZLE at checkout in the "Zazzle Coupons/Gift Certificates" box. 14.02% of the product net sale price will be deducted when one or more qualifying products are purchased and the coupon code IHEARTZAZZLE is applied at checkout. The net sale price is the price of the product (excluding shipping and taxes). Offer is valid through February 14, 2011 at 11:59pm ET. This offer does not apply to past purchases and may not be combined with any other Zazzle promotional or volume discount offers. If a volume discount applies to your order, you will receive either the discount set forth in this offer or the standard volume discount, whichever is greater. Offer valid on Zazzle.com only. Get a cute calendar on your wall! Enter code: DONTWAIT2011 and you will get 50% off all calendars. This expires March 1st, 2011. 50% of the calendar net sale price will be deducted when one or more qualifying calendars are purchased and the coupon code DONTWAIT2011 is applied at checkout. The net sale price is the price of the product (excluding shipping and taxes). Offer is valid through March 1, 2011 11:59pm PT. This offer does not apply to past purchases and may not be combined with any other Zazzle promotional or volume discount offers. If a volume discount applies to your order, you will receive either the discount set forth in this offer or the standard volume discount, whichever is greater. Offer valid on Zazzle.com only. Happy February everyone! Here's a secret coupon for those who wants save a little money shopping your your Valentine. Click here to save 10% off anything at FidesDesign when your cart totals $20 or more. The lower price will automatically reflect on the product. This offer is good till March 31, 2011. 10% of the net sale price will be deducted when one or more items are purchased and the order subtotal is greater than $20 (excluding shipping and taxes). The net sale price is the price of the product (excluding shipping and taxes). Offer is valid from from today through March 31, 2011 at 11:59pm PST. Your Zazzle order must be placed during that time to qualify for this special pricing offer. This offer does not apply to past purchases and may not be combined with any other Zazzle promotional or volume discount offers. If a volume discount applies to your order, you will receive either the discount set forth in this offer or the standard volume discount, whichever is greater. Offer valid on Zazzle.com only.